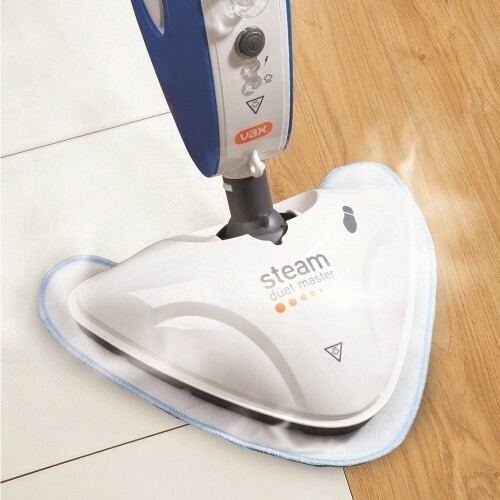 Powerful steam mop function for use on sealed hard floors. 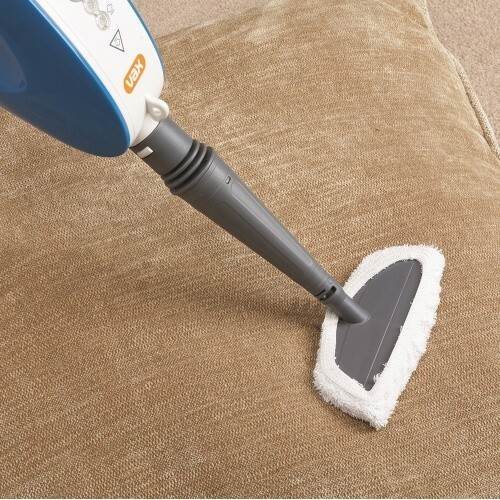 Integrated handheld steamer for above the floor cleaning needs. Fast heating – your steam power is ready in just 60 seconds. Lightweight design for easy manoeuvrability. Comes with reusable easy-fit microfiber floor pads. 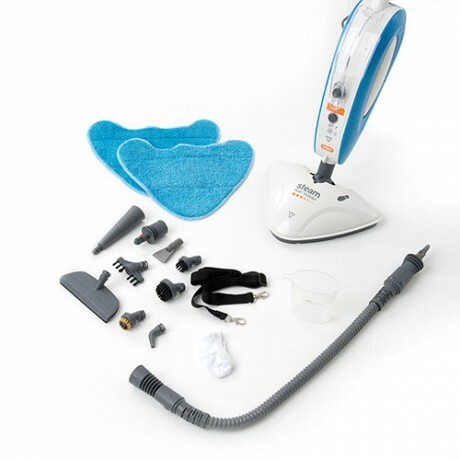 The Vax Duet Master Steam Cleaner has a versatile tool kit to enable you to clean above the floor. 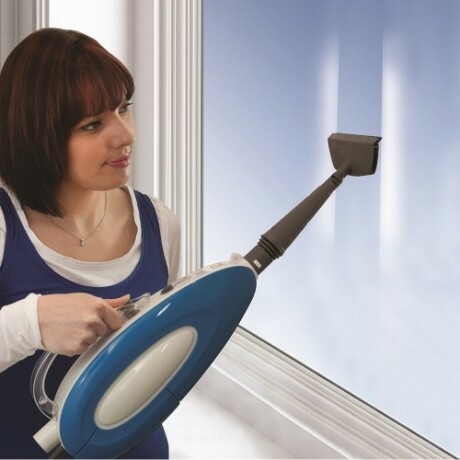 You can clean grout, windows, upholstery, tiles and much more at your own convenience and with ease. The handheld simply detaches from the body with the click of two buttons at the handle and the base of the machine for a total home clean. Rather than moving dirt around like a traditional mop and bucket, the Vax Duet Master Steam Cleaner will tackle germs with ease and won't leave floors soaking wet as they dry almost instantly. The Duet Master Steam Cleaner will powerfully clean all sealed hard floors such as wood, tile and laminate. 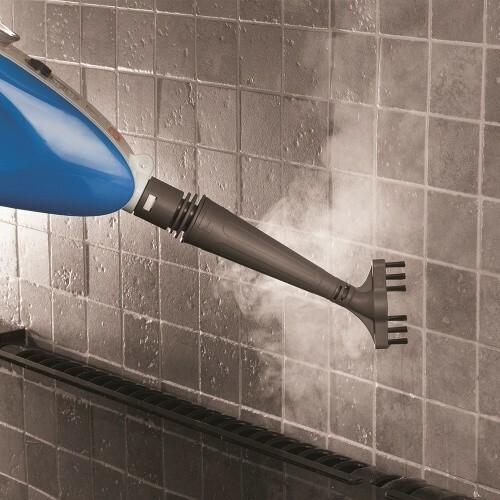 You don’t have to wait around in order to steam clean as its ready to use in 60 seconds. 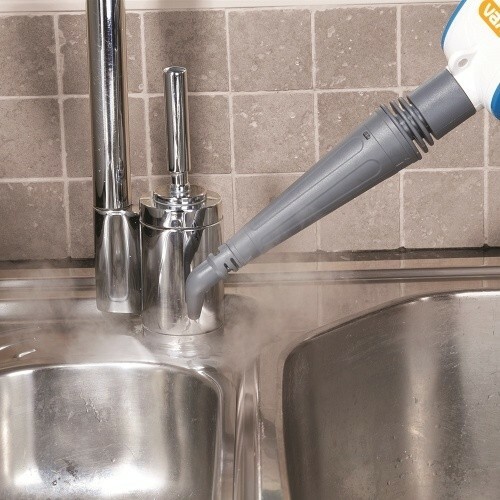 It's quick and easy and can last up to 12 minutes with continuous use for quick cleaning. Vax Duet Master Steam Cleaner is rated 4.6 out of 5 by 46. Rated 1 out of 5 by NyankoTofu from Disappointing Because of the good reviews here, I bought and was extremely happy with it. I bought mine a year ago and it was working really well at the beginning. Ever since then, I have been using it twice/thrice every week for my one-bedroom apartment. However, after using it for nearly 11 months, it started to show signs of spoiling. The water started to not heat up at all and very little steam seems to come out of it when I press the steam nozzle at the handle bar. I have no idea what to do with it. Do I buy a new one because I really like how easy it is to use but am afraid it will gradually stop functioning again. Please help!! Rated 4 out of 5 by Laf46 from Good Steam Cleaner Bought this just over a week ago and had good results, gives a good blast of steam and is working well. Have also used on some upholstery with good results. My only criticism is that the clip that needs to be pressed to detach the cleaner from the handle is made of plastic and is exceedingly stiff. I have arthritis in my hands and am unable to press it hard enough, have to ask my husband to do it for me, this worries me as wonder whether being so rigid it will break in time. Rated 5 out of 5 by kellmarie892 from Better than I expected!! I was a little skeptical about this as I read some good but mostly bad reviews about this product. However I am so glad I still got it because it is amazing. I love it. It does the job. Rated 5 out of 5 by ja_zy from Awesome!!! Best cleaning buy ever!! This is my first ever steam mop and its changed my cleaning life. We live in a large inner city apartment with tiled and hardwood floors. Mopping used to take hours and so much energy, and floors would never seem clean. I now have sparkling floors with no effort required. I was looking at expensive steam mops $400++ until I read reviews on this one and decided to give it a try. For $72 (on sale at Target) I didn't really mind if it wasn't that great. But it is amazing. Honestly, truly, best household item I have ever bought. So happy!! You have to get one!! Rated 5 out of 5 by Jonks from BETTER than shark! Owned a shark steam mop for two years, kept having stints where it just wouldn’t make steam so bought this as a replacement. Wish I’d done it sooner! Leaves less water on the floor so it dries quicker, nicer and lasts longer! Shark would run out of water after two rooms and leave a streaky mess, this does the whole house and doesn’t leave any residue at all. Long cord, really cheap, reputable brand. Highly recommend. 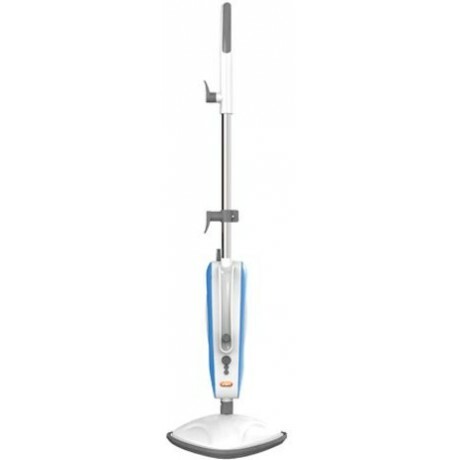 Rated 5 out of 5 by HouseHusband4740 from 2nd Vax Steam Mop - Same model This is the second Vax Steam Mop - VSTduet1600 that we have purchased. Loved the first one and was glad to find that it was still available when I needed to replace. Does a fantastic job and represents great value for money. I have only given it 4 out 5 stars for quality purely based upon the first one only lasting 15 months. I.e. three months out of warranty. Obviously, I still think it is well worth the purchase or I wouldn't have purchased again. Rated 5 out of 5 by Pottygirl from Great Product Better than expected. Love all the attachments to get to this hard to clean places. A great buy and highly recommend. Rated 5 out of 5 by mainframe from Great all-rounder We have a one bedroom apartment that is half tile (hallway, storage, laundry, bathroom, kitchen, and up one side of the living area), and then carpeted in the bedroom and lounge area. I was sick of using a regular mop and having wet floors that took ages to dry. I have an indoor dog and I'm a little obsessive with keeping our place looking good at all times. So I was looking for a decent steam mop for a decent price. Nothing too elaborate as it's not like I need it to do a two storey house or anything (and lets face it, living in Sydney means i'm likely NEVER going to be able to afford that....) I read the reviews on this unit and went to pick one up from Target at Eastgardens, Sydney. I used it once last night and again today and I LOVE IT! 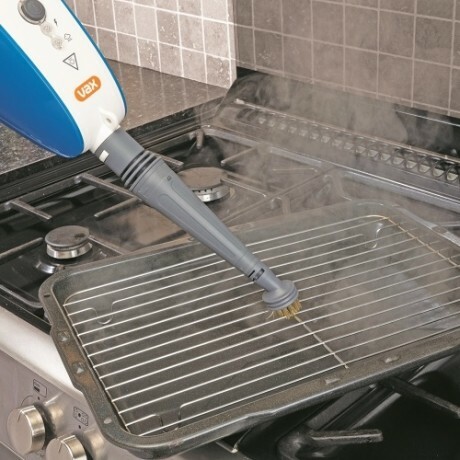 Through a bit of initial trial and error I recommend you read the instruction booklet, specifically where it notes not to hold down the steam trigger constantly as you will end up with wet floors...the trick is to do short bursts of steam as you're going along. The tiles feel so good to walk on with bare feet, the same feeling as they have when i go to town and scrub the grout with gumption and then mopping with bleach. This brings me on to the BEST part of this steam mop - the fact that you can use it as a steam cleaner (and it comes with a bunch of accessories to scrub grout, clean windows and mirrors, etc.) It blasted away so much gunk from the grout effortlessly and there was some scungy bits in the hinge on our shower screen door that it has cleaned so well it looks brand new again. (Tip: blast the grout/taps/shower hinges/etc. FIRST, and then mop up the residue and excess water created to do that with the mop) Next project is the windows! Does it require a pumping action when using like other steam mops? Or does the steam automatically release? The User Guide for the VST Duet 1600 makes no mention of how the hose is used. Can you please explain where it attaches, and what it does? 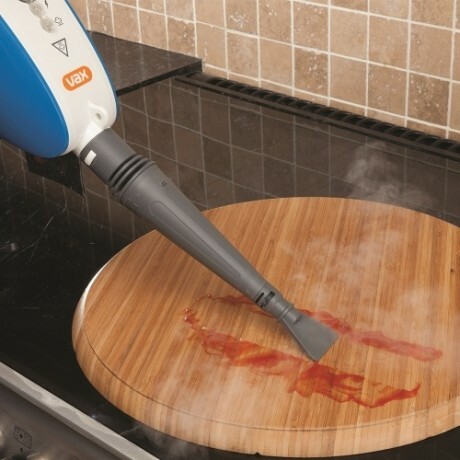 Can you steam clean curtains with this? Are there spare parts available for this model, ie the filter behind the water reservoir. 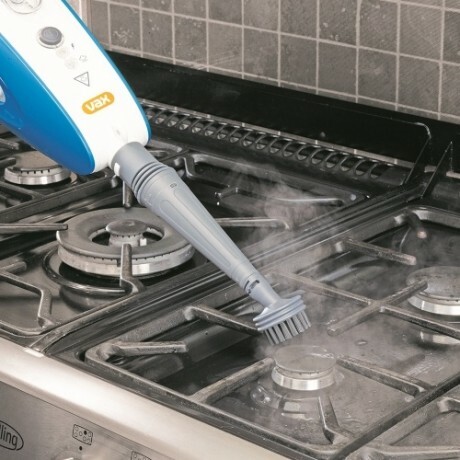 Whats the temperature of this steam cleaner?! Is there a setting we can control this?